Two new polls continue to show that support for the Maduro government has never been softer. The first one is from Datanálisis. Obviously, one of the slides that jumps out is the one showing that support for Maduro has never been this low. Nevertheless, we should be careful. 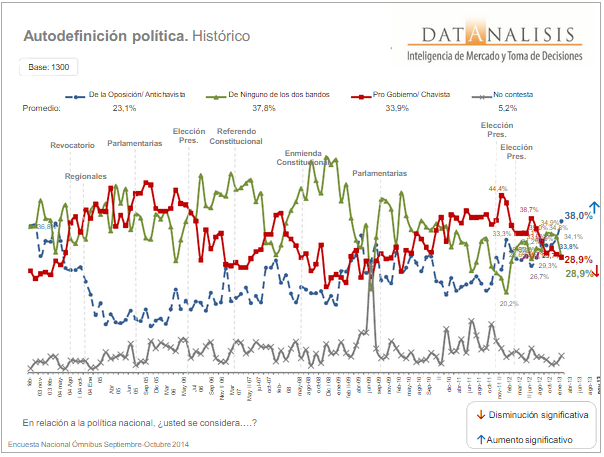 While the opposition is currently more popular than chavismo, it’s not like this is the worst chavismo has been, as this graph shows. As the economic crisis continues, we should expect support for the government to continue going down. 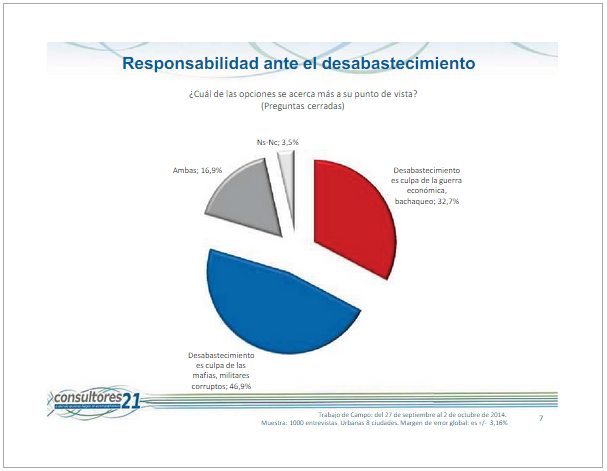 A full 46.9% of the population blames “mafias” and “corrupt military personnel” as being responsible for scarcity. If you add those that say “both,” including “economic war” and “smugglers,” you get 63.8% of the population. It’s amazing that the military has somewhat not received the brunt of the blame for Venezuela’s problems given how both the previous government and this one are composed of military people through and through. I guess this points to a cultural feature of Venezuela, whereby the military is held aloft as a worthy institution no matter what.